The Mahindra Mojo UT300 loses out on certain features in order to be more pocket-friendly. Mahindra’s stint at developing two-wheelers has been quite lukewarm so far. While the scooter and commuter bikes from the company collect above-average sales, the premium motorcycle Mojo didn’t receive a similar response. In order to reduce the price of the 300cc bike, the company decided in favour of removing certain bells and whistles. The Mahindra Mojo UT300 aims at collecting better sales numbers than the existing model by decreasing the final price substantially. Want to know more about the Mahindra Mojo UT300, read along. 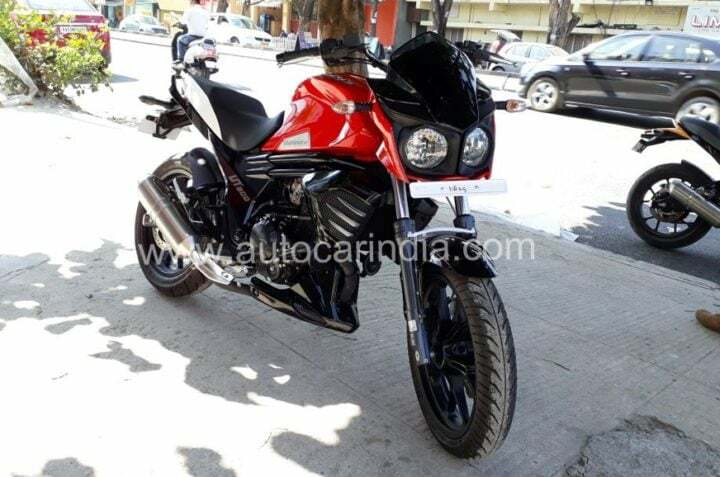 According to a report by Autocar India, the upcoming Mahindra Mojo UT300 was spotted at the dealership recently and certain dealerships have even started accepting the booking of the upcoming variant of Mojo. You too can book one with an amount of INR 5,000. As the pocket-friendly Mojo has already reached certain dealerships, we expect the deliveries to start in the coming weeks itself. The current Mojo retails for INR 1.7 lakh ex-showroom, the upcoming variant of the premium motorcycle will cost around INR 30,000 less. The Mahindra Mojo UT300 will retail between INR 1.4 to 1.5 lakh ex-showroom. The Mahindra Mojo UT300 being a cheaper version of the Mojo loses out on various features and cycle parts. The upcoming variant of the Mojo looks visually the same with the only defining factors being missing DRLs at the front and the lack of gold-coloured accents. We favour the latter since the gold-coloured accents seemed a little out of place on the Mojo. The prototype testing the new UT300 was spotted about 1.5 years ago. The spy shots received back then, revealed everything about the new variant. The upcoming Mahindra Mojo UT300 loses out on the DRLs above the twin-pod headlamps. The conventional forks replace the premium USD forks and a carburettor moves in replacing the fuel-injection system. The latter differences will affect the performance slightly. The Mojo UT300 features a single exhaust instead of two on the standard bike. These changes will affect the weight of the bike for good. Mahindra also switched to MRF Nylogrip tyres instead of the Pirelli Diablo Rosso II tyres on the stock Mojo. This doesn’t come as a surprise considering the aim was to decrease the final cost of the bike. The upcoming Mahindra Mojo UT300 houses the same powertrain as the standard version. The 292 cc single-cylinder, liquid-cooled engine churns out 27 PS of maximum power @ 8,000 rpm and 30 Nm of maximum torque @ 5,500 rpm. The performance figures on the Mojo UT300 will change slightly as it loses Fuel Injection in favour of a carburettor. The upcoming Mahindra Mojo UT300 will compete with the likes of Royal Enfield Bullet 350, Bajaj Dominar 400 and the Yamaha FZ25 upon launch. The outgoing Mahindra Mojo failed to impress the buyers. Will the new version bear similar fate, or would it jump start the sales of one of the most capable bikes in the segment? Stay tuned to read more about upcoming bikes in India.